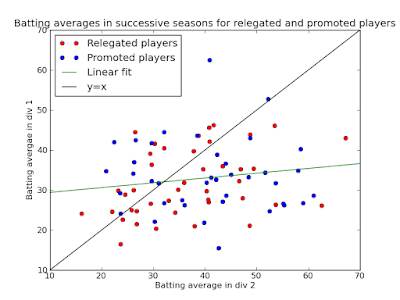 We need to look at the data: How much more valuable are first division runs? Interesting data. Your linear regression should go through zero, which would give you a better sense of the difference. In this case, as they are both on the same axis, you can just take the average of div1_runs/div2_runs to get the comparative value. When I can get around to posting stats (rarely) I prefer to plot batting averages on hyperbolic axis, as it gets rid of the weird outliers (averages of 70+). If you think about an innings as a sequence of binomial probabilities of getting one more run (p=1/average), then it makes more sense, and should give an accurate linear fit (in this case, your data runs from 0.016 to 0.05). Notwithstanding all that. It is probably true that players averaging less than 32 will do better in division 1. 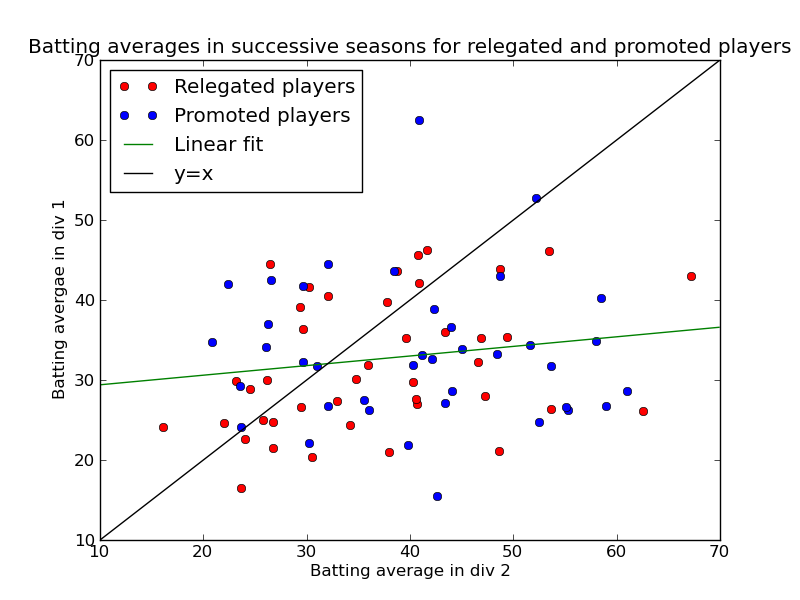 There is a lot of luck in an average, so a player who averaged < 32 in division 2 will most likely gain from regression to the mean more than their performance will reduce in division 1. If you could adjust for expected regression (compare to career average, or trajectory because it changes with age) it will give a better number. (And age trajectories are a hugely important topic as yet uncovered in cricket stats. Hit me up at idlesummers if you want to discuss it).